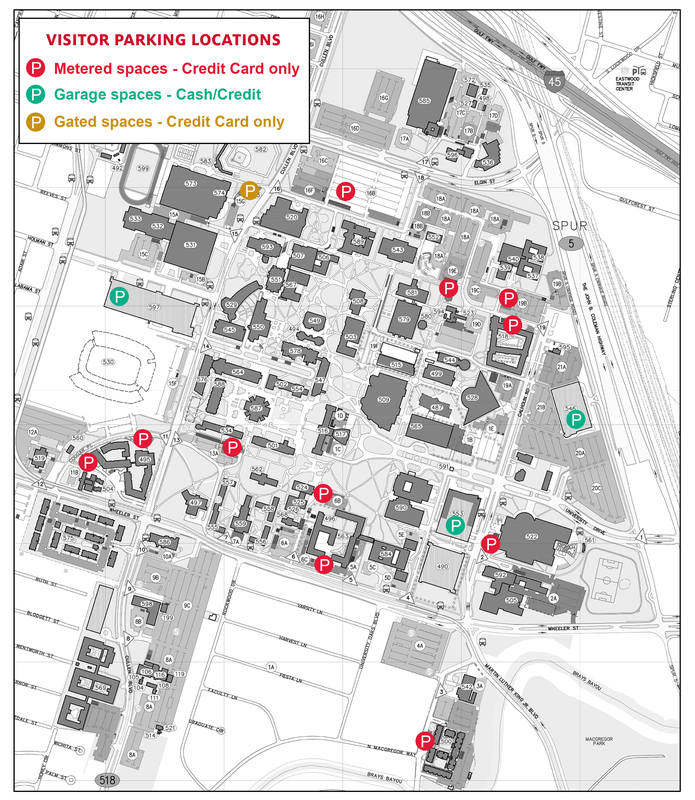 Visitor parking is available at 11 meter locations, three parking garages, and one gated surface visitor parking lot on campus. Here's a map of all visitor parking locations. Click below to see the locations' visitor rates. For those wishing to pay for all or part of their guests' parking, validation coupons are available in 1hr increments, up to a full day charge, for use in the 3 Parking and Transportation Services parking garages, as well as Lot 15G. Purchasing 20 or more all-day validation coupons qualify for a 25% reduction in the daily parking rate. Validation coupons must be purchased in advance. Here's a form to request validations. Please note, parking garages accept both cash and credit card payments; however, all meters on campus are credit card only machines. We accept Visa, MasterCard, Discover and American Express. Parking permits are not a substitute for paying a meter. During periods of high parking volumes, PTS will be converting surface lots in the high volume areas from valid UH permit only parking to evening/weekend/event parking on weekdays after 4 p.m. and all day on weekends. 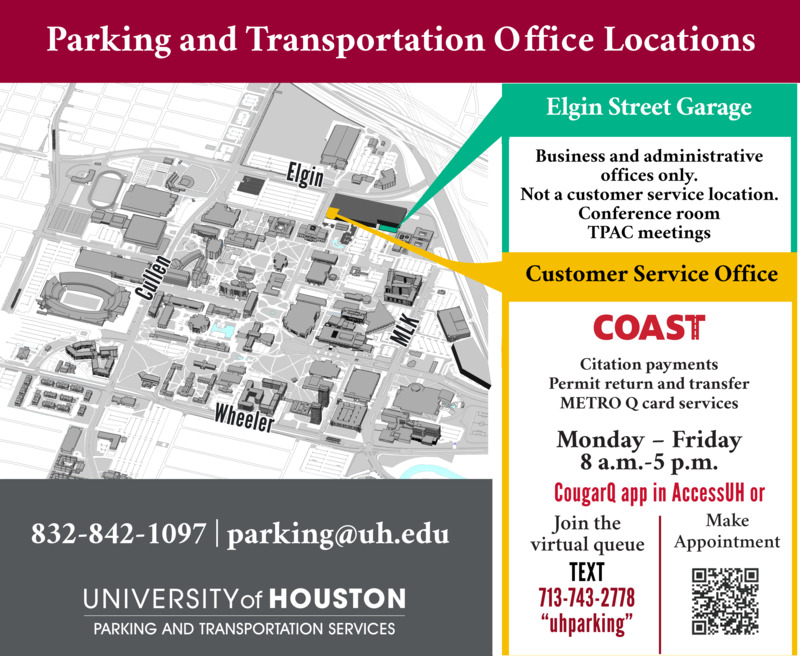 Each of these areas will be staffed with easily identifiable parking attendants who will pre-collect the parking fee and issue event parking tickets to each vehicle not displaying a valid UH parking permit. The cost of event parking will be $5.00 and payment can be made with either cash or credit card. There will be times, such as on athletic game days and University sponsored events, where these evening/weekend/event parking areas will not be staffed by PTS for guest/event parking. Visit the Special Event Parking Page for more details on these events. On these days guests will need to utilize one of the other campus parking options. In the event that no attendants are in place, evening/weekend/event parking will only be available in visitor garages and meter parking. Any vehicle parked on UH campus without the proper and valid UH parking permit or having paid for guest/event parking, will be subject to citation or tow.